Quiltmaker 100 Blocks, Vol. 5 Blog Tour! Welcome, welcome to my Quiltmaker 100 Blocks Blog Tour Post! It is with the utmost pleasure that I share my block and quilt from Quiltmaker’s 100 Blocks Vol. 5with you today!I’m celebrating by not only sharing my block and lots of fun photos, but with fun giveaways! Make sure you scroll to the bottom for details! If you do a little bit of poking around on Sewhooked, you’ll find that I’m absolutely obsessed with paper piecing! I design my own patterns, I teach paper piecing courses both online and in real life and I am active in a number of paper piecing groups. Just recently, I hosted the Garden Party Blog Hop, which featured a new paper pieced pattern every day during the month of April, each by a different designer! You can also find me right each week hosting Talk To Me Tuesday, my crafty show and tell vlog! 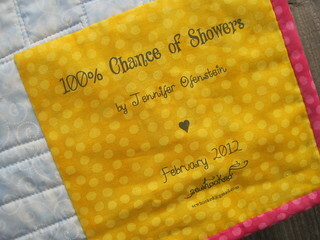 Enough about me, on to the fun stuff…my Quiltmaker’s 100 Blocks contribution… May Showers! Meet Sue. She’s a sweet little lady, heading out for the day. 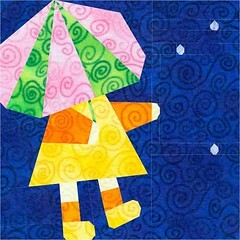 She takes her umbrella and then reaches out to see if it might be raining. April is over now and she’s ready for May flowers, but a few drops of rain are still falling! How about trying May Showers in a variety of fabrics? Just look at that sweet little hand! Don’t be scared of tiny pieces, they’re just like any other part of a paper pieced pattern, but with less stitches! I do tend to make a mess when I work! 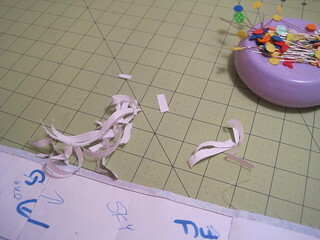 Quick Tip: When stitching block units together, remove the paper that is inside the same allowance after you stitch. That will keep those tricky little pieces from getting stuck when you stitch across the seams. Sue and her house (which had to be purple! ), in progress (above) and a great photo I took outside (below) before mailing 100% Chance of Showers off to Quiltmaker! This quilt is actually four individual blocks, all created to work together! It’s made primarily of Moda Marble coordinates. To quilt 100% Chance of Showers, I outlined the shapes of Sue and free-motion quilted in the background. 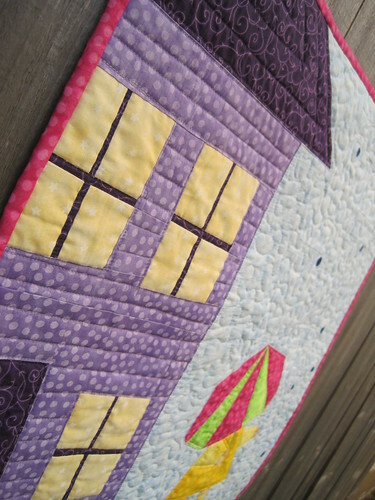 For the house, I added “siding” with stitching and quilted around the windows so the panes would stand out. I make most of my quilt labels by ironing a piece of fabric to freezer paper and securing the top with masking tape. It works fantasticly, as you can see! To make attaching my label a bit quicker, I stitch two sides into my binding before appliqueing the rest. Leave a comment on this post and you’ll be entered to win a free copy of Quiltmaker’s 100 Blocks Vol. 5! Another lucky reader will win a free PDF copy of my my pattern set, Fanciful Fairies! You have until May 8 to comment! Only comments with email addresses will be included in the drawing. Use coupon code QUILTMAKER now through May 8 and get 20% off your total purchase from the Sewhooked Shop! Offer not valid on Etsy or Craftsy. 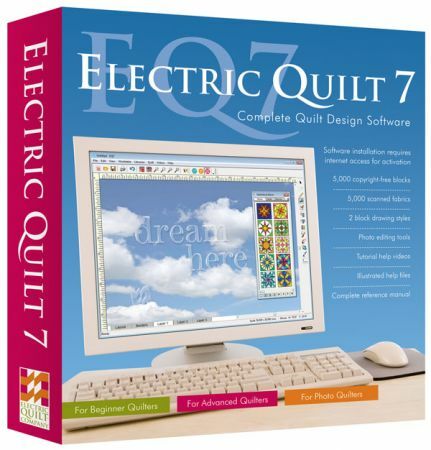 I am giving away a copy of EQ7, so be sure and check out my Garden Party post from April 28 for details on how to enter! Winner to be announced on May 7. Thanks for stopping by, I hope you enjoyed my Quiltmaker 100 Blocks Blog Tour Post and that you’ll stop back by sometime soon! If you’re local to the Austin, Texas area, please stop by Honey Bee Quilt Store on Saturday, May 12 from 10am-Noon for my trunk show! There will be copies of Quiltmaker’s 100 Blocks Vol. 5 for sale at the shop and I will be giving away a wall hanging made from May Showers to one lucky visitor! This entry was posted in Blog Hop, Quiltmaker Blog Tour and tagged 100 blocks, 100 blocks blog tour, giveaway, paper pieced, quiltmaker on May 3, 2012 by Jennifer Ofenstein. I love Sunbonnet Sue. Your block is a great variation on the tried and true classic. I am so excited for you! You deserve this Jennifer, way to go you talented girl! Super cute, the boots are my favorite detail! Love it! 100% chance of rain!! Even as just a smaller version square with hmmm some sunny days popping in too! 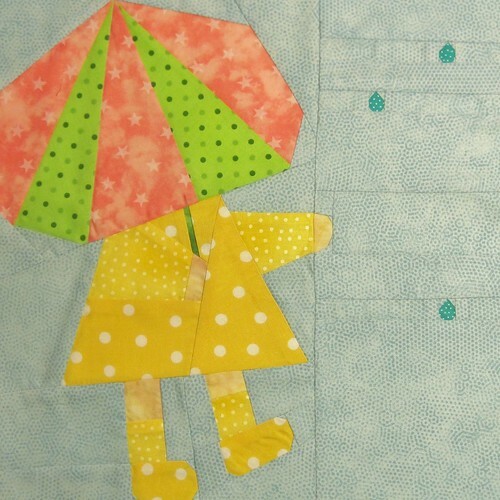 I so want to learn to do paper piecing…i love this little girl! She’s adorable. She would fit real well over here in Australia at the moment with all the rain we are having. Shame that I cannot find The 100 blocks magazine over here. Would love a signed copy with your signature. It`s absolutely wonderful.I love this doll.Can´t wait to make it.Thanks!! What a pretty block! And so suitable for here in the UK where we have just had the wettest April since records began…….and it continues to rain! So cute! And the little quilt is darling. i love walking in the rain 🙂 cute block! Absolutely adorable! Way to cute, I literally almost squealed. Love your Sweet Sue block – and the quilt you made is darling. Thanks for the chance to win. Love it! She reminds me of my granddaughters in her little yellow slicker and rain boots! I am a big fan of paper piecing and I love your block! Thank you for the label tip that’s awesome! I think your Umbrella Sue is cute. I have never seen “Sue” done in paperpiecing before. Great block! I am really looking forward to seeing the entire magazine! What a cleverly cute block! So cute! Love the quilt you made with your cute block! Thanks for the chance to win! Such a cute block! So lovely! It’s a great block with so many embellishment possibilities. I love your block! I would buy the magazine just for this block!! What a cute block! Love the little quilt, too! You do good work! Love it! Her sweet little boots are my favorite part! Great job Jennifer (as always)! Love,this block. This just might get me to paper piece! Congratulations. Your block is super cute. Your block is adorable! I would love to win the book! Congrats to having your pattern in the magazine. It is so cute. Sue is so cute! I love paper piecing (and applique). I can already see this block in a wallhanging I’m planning. I Love Your “May Flowers” Block! I also Love your Quilt Label Name! 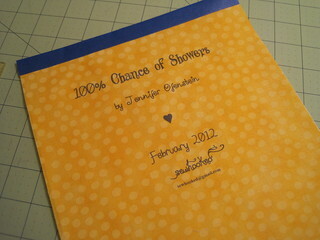 Thanks for having this Great Giveaway for Quiltmaker’s 100 Blocks Volume 5! How exciting for you. Love your Sue block and the quilt you made! This block is so sweet! 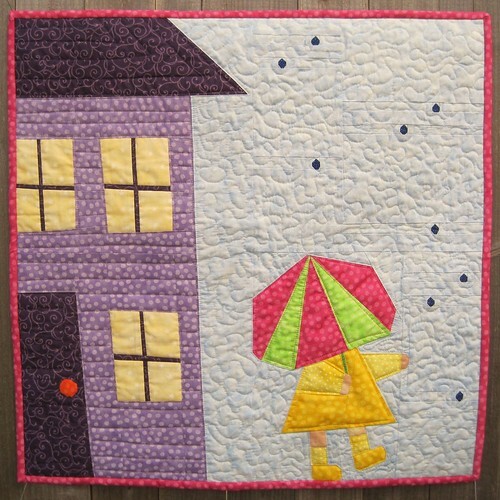 I love the raindrops you added to the quilt as well. This is the cutest paper-pieced block ever! I love the Sunbonnet Sue block. 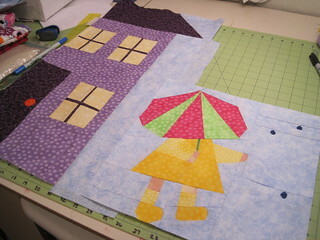 I am currently making a Sunbonnet Sue quilt but I am doing applique on it. I have never tried paper piecing one. Yours looks great! Congratulations and thanks for the giveaway. I love your block. It is neat How you took the traditional April Showers bring May Flowers and then added the twist that the rain does not stop just because the calendar date changes. I have already won a copy of the magazine, and I would appreciate it if you would consider me for the fairy pattern drawing. I think they are real cute. Thank you. A cute sunbonnet Sue block. Love it. What a sweet block! Would be cute on a quilt for my grandbaby! Congrats! Thanks for the freezer paper tip! This block is adorable! And perfect for April/Spring. Thank you for showcasing the block. What a sweet block! Would make a cute quilt for my grandbaby. Thanks for the freezer paper tip! Congrats! Cute, cute, cute!! 🙂 Thanks for the giveaway chance, and congratulations. very cute block. And I love the Sunbonnet fairy! Congrats on your cute block. I know a little girl who would love it, too. Ilove the chances of rain hanging!!!!! 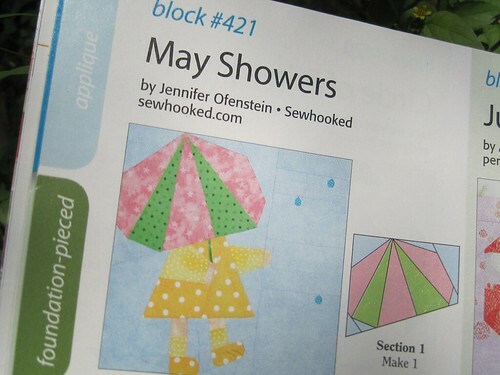 I like the May Showers block, but then I’m fond of Sunbonnet Sue. You may even get me to like her. I see more things through little granddaughter’s eyes now. Love the raindrops. You have the cutest paper-pieced block. With the chance to rain today, this makes your block even more special. I like purple too, so I really enjoy the quilt you submitted to the Quilting Gallery. Thank you for your participation and the winner will certainly enjoy this creative magazine. Oh how fun those girls are. Thank you for a chance to win, although paper piecing scares me! What a cute block. Appropriate for this time of the year. Squee! I’ve been waiting and waiting to see which block is yours. It’s perfect for today’s weather. I love seeing the progress of your career. I really like your April showers and house block. so sweet and spring like. love it. Love the foundation piecing. I’ve just started doing it myself and creating my own patterns! What a cute block. Still lots of showers here, even if it is May…Sue would fit right in. Thanks for the chance to win. Love your block. I love paper piecing too. Thanks for the chance to win! Block is darling but I can’t imagine doing those raindrops! I love, love, love your little umbrella girl. I also love paper piecing. I am bookmarking your blog for future reading. Thanks for participating. Love your block, Jennifer. Combining the house, the girl and the unbrella is so great. You keep me coming back , between the garden party blog and now this, I can’t stay away. Thanks for all that you do. So many great blocks in this issue; thanks for chance to win! That is a perfect block for this month, we are getting lots of showers, but we need them. I LOVE that your block is paper-pieced. Thank you. So many “Sue” blocks are just applique. What a cute block! I love the umbrella for some reason. Thank you. I absolutely LOVE your creation! I do feel a wee bit intimidated by it. I have not paper pieced, something I would have to read up on and attempt before trying your block for sure, lol. Again intimidating but love it! I love this block. I have made two sunbonnet sue quilts already and would love to try a diiferent version. This is super cute, and it looks great put into the quilt with the house. This is an adorable block! And I love its name too! She is so cute! And so is her quilt! Great block. My daughter requested a year of table topper mini quilts and I was thinking I needed something with rain for APril. Your block is perfect. What a cute block and the wall hanging would look great in my granddaughters room. The house with your new block is really cute – wish we had a 100% chance of rain literally. How did you make those tiny raindrops? The details of your composition are wonderful. alternate email mlwright29(at)hotmail(dot)com Thanks for the chance. Very cute block! Thanks for sharing. Oh my goodness…what an adorable block! Thanks “sew much” for this chance to win!! Well you stole my heart. now how much cuter could that block get? None, it is already so stinkin cute. thanks for a chance to win the “orange” magazine or pattern. I have to make a quilt with your new block. Can’t wait. i AM in the Austin TX area but will be going to Houston for the Mother’s Day weekend to visit my daughter and granddaughter. I’m so sorry to miss your trunk show. Thanks for sharing so many great details of your block. I love to paper piece and your block is adorable. 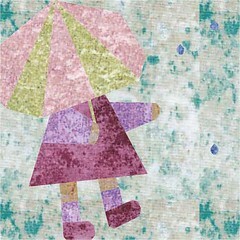 Your May Showers block is so cute!! Thanks for the opportunity to enter your great giveaway! What a darling little block — and so appropriate for spring. I’m not sure exactly where I will use it, but I will. Your block is absolutely darling. Grats for getting it published. Congrats on your great block! Your SBS is too cute. Thanks for the giveaways! What an adorable block and quilt! I am amazed by the tiny pieces in your work!! Thanks for the chance to win! so sweet…just see my DD when she was small splashing and having to have an umbrella for those very infrequent rain showers in W Texas!!! I LOVE your block. It’s just adorable. Congratulations on being chosen to be in Issue 5. I love, love, love 100% chance of rain. I am an umbrella lover, so this block just draws me. However, I have never paper pieced and that would be the challenge for me. Great block. Very sweet block. I haven’t tried paper piecing yet. I’ll get there! Thanks for the inspiriation. I just love your block , that is just so cute , my granddaughters would love that little quilt. Sure wish I lived close enough to attend your trunk show I am sure it would be wonderful. Thanks for the chance. Great tip about removing the paper from the seam allowances. What a cute block!! Suits our Seattle weather to a tee!! I want to add this block to your garden party blocks because we garden in the rain!! Thanks for the giveaways. OMG!! I was looking for a cute block for a friendship block…perfect!!! What a cute block! I’ll have to use it for something for my granddaughter, she’d love it! Thanks for your giveaway. When I get a granddaughter she will have a quilt with this block in it! Thank you for sharing! Love your block. Thanks for the giveaway. YOur block is so cute and I love the little quilt you made too. Your work is so very nice. Congrats. Your quilt block is so cute! It makes me smile:) Thank you for the wonderful giveaways! I love your block! It is adorable. She is really cute Jennifer . I love her!! And I love her coming out of the house . A really sweet block . Is the magazine available internationally or just in USA? Your Sue is so cool! How fun this block is. I haven’t tried paper piecing yet, but this block is a perfect reason to start. this is the cutest “Sue” I’ve ever seen. Must try her! Paper piecing is not my favorite way to make blocks, but your quilt is so adorable I don’t having to paper piece it. This is a great block…perfect for the rainy Pacific Northwest! I right away thought how fun to make a bunch of the girls on the streets of Seattle with the Space Needle, Pike Place Market, Pioneer Square…. I love your cute block. I have not tried paper piecing yet but your block has definitely inspired me to try it. I love your blocks!!! They make me smile:) Thank you for these wonderful giveaways!!! Love, love, love your patterns! This “Sue” is especially cute! Adorable block! thank you and congrats! I think your block is great! I’m new to paper piecing and love the precision it gives. Thanks for the freezer paper tip. I will use it on my next label. What a cute block! Congratulations! Thanks for the chance to win! “SEW” cute. Love the block. Congrats to you. I love the accuracy of paper piecing. The block is darling. Cute block! Thanks for the giveaway. Now that is adorable. Love love love it! What a cute and clever block and quilt. It’s like a Sunbonnet Sue in the rain. Love paper piecing & your little girl is so cute! Yay yay yay! Just beautiful, and such a refreshing and modern take on Sue. Well done! Such a cute block. Maybe someday I’ll have granddaughters. this little quilt is absoutely gorgeous!!! What a fun quilt block! I am fairly new to quilting, so haven’t yet tried paper piecing yet, but I do look forward to trying someday soon! Thanks for the chance to win. That’s a sweet block, I love paper piecing! Also, thanks for the label tips. Just as sweet as can be. Great block. 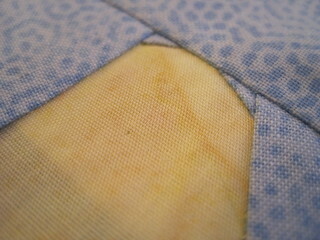 Your block is awesome, and thanks for the tip on pulling the seam paper off. I read your blog thru Google Reader and I LOVE it. The Garden Blog hop was the most amazing and I can’t wait to make every one of the patterns. I don’t need a magazine, but I couldn’t resist entering for your pattern. I have never tried paper piecing and now I am going to have to! Love your cute little block and what a cute quilt it would make! Congratulations on being chosen to appear in Volume 5! I have the other 4 issues and can’t wait to get this one in my hands!! Absolutely love your block..I originate from BC/Canada where it is said we “rust” because of the amount of rain!! 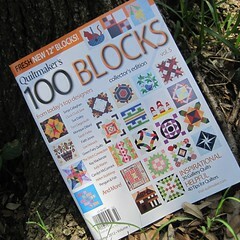 Thanks for a chance to win one of your giveaways..I already have the first 4 volumes of Quiltmakers 100 Blocks. 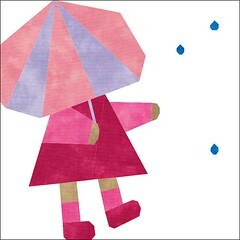 I love your ready for rain umbrella girl. It is perfect for where I live (Oregon) since we get lots of rain which I love for the beautiful flowers it brings. I like the detail paper piecing allows. Hope I win. Would love the chance to win a copy of this book. Very nice block you made! yay you!!! so happy for you! She is just too cute and her purple house perfect! It makes me want to try paper piecing ! I love the May Showers block. I would love to win my very own copy of the book. What a cute block. I think this is my favorite 100 blocks book so far! That is so cute. Opens up a whole lot of ideas for other blocks doesn’t it? Your block is sooooo cute! I love paper-piecing too. Sue is so sweet! I can hardly wait to get my hands on this issue…one way or another! Your little girl looks so cute! What a great idea to add her to a house! Now.. for a puddle, or hand stitched rain drops! The darling girl in your block is just perfect for the weather here in Vermont! Rain, rain and more rain. She’s just adorable, and I love your paper-pieced projects! Thanks for sharing and congratulations on having your block in 100 Blocks, Vol. 5. I’d love the magazine! 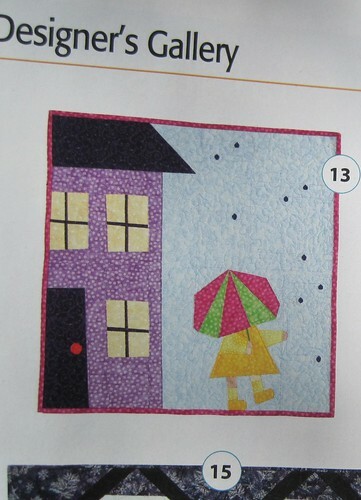 Wouldn’t it be fun to use the May Showers pattern as a shower gift?? What a cute block! Thanks for the giveaway! I like your block – that is so clever. I’ve never tried paper piecing, but I’d like to learn. I love your paper pieced blocks. Thanks for sharing. Yea Jennifer! I’ve been a fan of your patterns for the past 5 years and I’m thrilled for you that you are published in this Quiltmaker vol. Your rainy day sue is perfect for those of us who live in the wet Puget Sound region of WA state for sure!! Congrads!! I like the block!! Your block is adorable and so are the fanciful fairies. Thanks for the chance to win the magazine and pattern. congrats on having your block in the magazine. Jennifer, I love this little block! And the possibilities of the colour of her raincoat and boots are endless! What fun! Thanks. What a darling block–sort of Sunbonnet Sue meets the Morton Salt Girl. Your block is so cute! I love your little girl. Sweet Sue is really sweet I just love here. Congrats. Love your block–it’s so appropriate for living in the pacific northwest…..
this block is awesome. I have done paper piecing only once and could not get the hang of it. Maybe I should try it again now that I have been quilting and sewing for a couple of years. Your block is so creative and i love the detail. Each block with different backgrounds shows how versatile your design is. Thanks for sharing. Sweet Spring block! I am going to give this one a whirl! Thanks for sharing! Your block is delighful. thanks for the tips on how you secure your label too. I do my sleeves like that (secure the top within the binding first), but I never thought about doing the label that way..what a time saver. And you would be sure to have the label on when the quilt is done. I have several quilts that are “owed” labels, and I know if I used your method, they would be there right now! What a fun block! I have enjoyed Sunbonnet Sue and Sam, but never dreamed that there could be a paper-pieced version. Oh so cute block. Thanks for sharing and participating. Cute block. Haven’t done much paper piecing, but would like to try. Your block is so fun, love sun bonnet sue. Thanks for the wonderful giveaway. I have been following your website for about two years now. I don’t know how I found you but have saved all the Harry Potter patterns and have been saving the Hobbit patterns. I saved all the Garden Party patterns too. I just retired a month ago and have so much sewing to catch up on. I am currently finishing a work in progress for about 5 years now, a black, yellow and white quilt which is almost finished for my younger daughter. I have a Victorian costume to make for a steampunk convention for my older daughter. 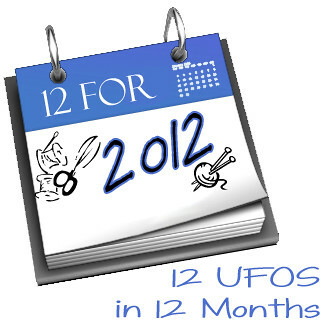 I have many projects and am going to try the 12 in 12 UFO challenge. Thanks for inspiring me. Living in southeastern Alaska in a rainforest, this little girl would right in. She certainly needs that umbrella. I would love to have her pieced in my quilt. Your block is just adorable, and I love paper piecing! Goodness, I thought you were a neighbor of mine. The rain just won’t stop and winter won’t leave. Grump, grump. I wondered who made that little cutie with the umbrella. Yes, I have done some paper piecing and it is great for accuracy. Cute Sunbonnet Sue variation! Thanks for entering me in your giveaway. This block is adorable! I have only done a little paper piecing but it is on my bucket list to try and do more. I think this block would inspire me to do some more. Such a fun block. Thanks for the tips. Very nice blog. 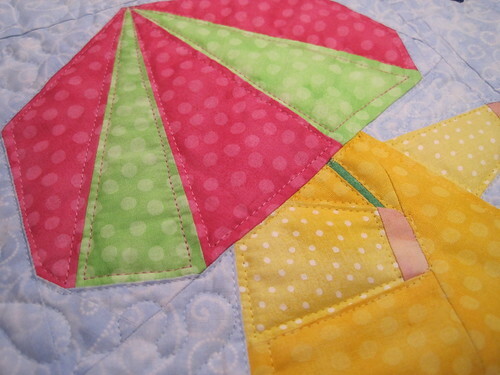 I love the colors you chose for the sunbonnet in the rain. What a cute block! The fabrics you chose are adorable. What a gorgeous block and I am glad that it got chosen. I also love the fairies patterns. What a great giveaway. Congratulations on the inclusion! Wow, congratulations! Love this block. I am also a fan of the fairies. You are so talented! I love to look through these magazine/books to get inspiration. The blocks are so neat and the instructions are great! Congratulations on your block being chosen. What an amazing and creative block! So nice to see fun paper piecing blocks in the magazine…can’t wait to sew it! 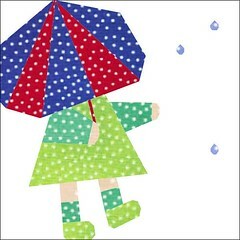 Oh, rainy Sue is very cute! 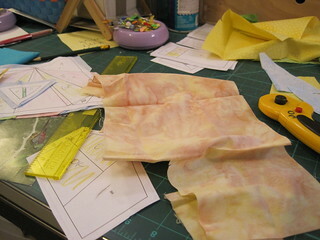 I love paper-piecing too, now that I use Peggy Martin’s Quick-Strip Paper-Piecing method! I love the swirly Moda fabrics, and I would sure love to use some in one of my quilts. And I would love those cute fairies, too, because my nieces are such girly-girls princesses and they love TinkerBell. Thanks so much and congrats! I love the may showers. Congratulataions for the block in the magazine. Love your Sunbonnet Sue block. Oh Wow! 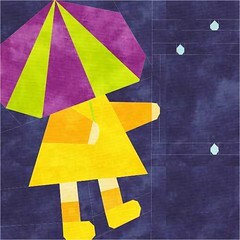 I love umbrellas and yellow raincoats! Your block is adorable! I am definitely going to have to make this one! I’d love a copy of this – I’ve seen so many wonderful blocks! Really attractive block – I also love paper piecing! Your block is just darling! I really like it with the house included. Congratulations on having your block included in this year’s Vol. 5. I wish I was closer and could come to your trunk show. May 12 is my birthday. hehe. Your umbrella girl block is just as clever as can be!!! I’d love to be included in your draw. I really like the block you designed. Thanks for the giveaway. I LOVE your block – love the setting, colors, all of it! That’s a sweet block, just perfect for the rainy west coast where my daughter lives. Love your block. Thanks for the chance to win your giveaway. Your May block is adorable! Love the block! I will be sewing this one up for sure. Haven’t done a gazoodle of paper piecing so I’m appreciative of the paper removal tip, and also sharing the mindset of a small piece is just like anyother only with less stitches. Seems the smaller the pieces are, the more heebie geebee I get! I plan on sewing this block up for my 4 yr old son who LOVES umbrellas. Perhaps some pirate or construction truck fabric for the umbrella and coat and voila! Congrats on the success of your block….and love the quilt too. What a great house (siding)! may showers is beautiful. Thanks for the opportunity to win a copy of the magazine. I love your paper pieced block. How cute! I would love to win vol. 5 of 100 Quilt Blocks. Thanks for the chance to win. I’ve just started paper piecing and really love this little girl! I would love this book!! THanks for the chance to enter! It’s so nice that’s your block in the book. Congratulations! So nice your block is in the book. Congratulations. I’m so thrilled that you were chosen to submit a block design for Quiltmakers 100 Blocks, Vol. 5 magazine. It is no surprise that you are considered one of the top designers in the country. Your block is whimsical and beautifully crafted. It would be an honor to win a copy of the magazine and your fanciful fairies pattern. Congratulations on your success, Jennifer! You have really outdone yourself with this Garden Party Hop! Happy Birthday and Happy Year! I love to paper piece and would love to have the fairies block. I love the May Showers block. I’m new to paper piecing but I’d love to try that block. Have a blessed day. I’m so lucky! I got to see this block in person….AND buy the magazine before it was supposed to be released. You are so talented Jennifer, I can’t wait to come to your demo.